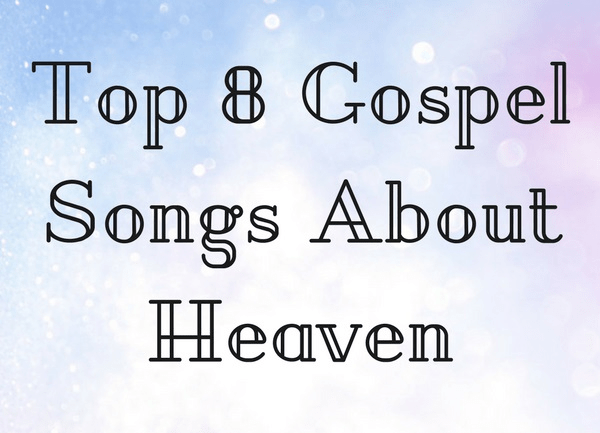 If you like gospel music, I believe you’ll love these top 8 gospel songs about heaven. The song, His Eye is on the Sparrow, by Whitney Houston, has been sung by several gospel music singers over the years, but none perhaps sung finer than the late Whitney Houston. This song almost sounds biographical for her as she sings about discouragement, and the “shadows” that come, and the heart that is lonely, so what keeps her moving on? It’s her longing “for heaven, heaven and home…when Jesus is my portion.” The point about God’s eye being on the sparrow clearly comes from Scripture where God even cares for the smallest of creatures. The psalmist wrote, “Even the sparrow finds a home, and the swallow a nest for herself, where she may lay her young, at your altars, O Lord of hosts, my King and my God” (Psalm 84:3), and so we know for sure that He watches “over me” and you! This uplifting song, Goin’ Up Yonder, makes you think about your eternal home in heaven as Walter Hawkins and the choir sings, “If anybody ask you. Where I'm going. Where I'm going soon,” he answers them, “I’m goin' up yonder. To be with my Lord.” With this eternal perspective, Hawkins can “take the pain” and “The heartaches they bring,” but the very best thing about this song is that’s he’s “goin’ up yonder,” and so he’ll “run this race” until he sees the “Savior. Face to face.” That is just what Gospel music should do…give us hope, fill us with joy, look toward eternity, and help us look past the pain of today. That’s just exactly what Goin’ up Yonder does. The late Elvis Presley is among the top gospel singers of all time, and even though he was known more for his hit singles, Elvis Presley left a huge imprint on the gospel music industry, particularly with this colossal hit, Take My Hand Precious Lord. Look at some of the lyrics and see if you can put yourself in his place, as Presley sings, “I’m tired, I’m weak, I’m lone[ly]…so help me…Through the storm” and “through the night,” and “Lead me on to the light.” Elvis Presley sang with confidence that after his days on earth were done, he knew, “At the river I stand. Guide my feet, hold my hand,” as he enters the Promised Land. Many believe he is already there. The gospel song, Oh Happy Day, by Edwin Hawkins, has been around since the early 1960s, and was in fact a hit single in 1967. I can remember hearing it in an African-American church and wishing it would go on forever. What a fantastic worship song, and even though it’s not exactly a song about how to get to heaven, or about the place of heaven, it’s about the Man from Heaven, Jesus Christ. This joyous song is so infectious that you can’t help but join in and praise the Man from Heaven. This song is all about the day “when Jesus Christ” and “Jesus washed,” and what a “happy day” that must have been for the people, and later, for us! By the way, Edwin Hawkins is the brother of Walter Hawkins who sang Goin’ Up Yonder, as well as dozens of other gospel classics. The focus of this gospel song, Soon and Very Soon, by Andraé Crouch, is all about heaven. The title emphasizes that the King could come, “soon and very soon,” as he is certain that “We are going to see the King,” and that’s worth a “Hallelujah,” or two, isn’t it? Some of the lyrics are based almost directly taken from Revelation 21:4 where the Apostle John wrote, “He will wipe away every tear from their eyes, and death shall be no more, neither shall there be mourning, nor crying, nor pain anymore, for the former things have passed away.” This is the very reason Crouch sings, when we “see the King,” there’ll be “No more cryin’ there.” The lyrics also refer to a time where the Bible says all nations will come to worship God, as Crouch sings, “We have come from every nation, God has already signed our name. Jesus took his blood and he washed my sins. He washed them all away.” One of the reasons why this song is one of the top 8 gospel songs about heaven is that it sounds like it came straight out of the Bible. Gospel music has been technically defined as a form of impassioned and spiritually rhythmic songs with its origins in the American South. It was developed out of a combination of rhythm, blues, and soul, but today gospel music is widely varied, and it depends on where you live because gospel music is unique to the local area’s culture and musical styles. The gospel music you listen to and what may be popular in your area, may be different than in the area that I live in, but these songs all have one thing in common; we’re all heaven bound, and we all await that sound, when “the trumpet of the Lord shall sound” and “time shall be no more.” That’s because in eternity, time is irrelevant.